How do you record your child’s growth in height? Growing up, my parents marked our heights along the edge of a sliding door. I remember the sigh my Dad gave when he had to paint over it because we were moving homes. We mark our children’s height along the edge of a wall that divides our living area with our dining area. In the last two months, N grew in height by about half an inch, M one inch and E a whopping two inches – his appetite has been massive these last two months. If we could measure in the same manner, N, M and E’s enjoyment and participation of reading this last month, I am sure we would see a growth spurt in this area. Because we read the same books every night for a week, they become familiar with the books and this enables them to participate actively in our reading time together. Being an active participant in anything makes life more enjoyable. This week, E joined N and M for our weekly books. He usually only stays for one or two books, but he is keen to be one of the boys and sits on his own chair and demands to have a cup of milk, just like N and M. He still needs close supervision (and hands nearby) to make sure that his milk doesn’t end up all over him and the floor, but he’s getting there. Our weekly books: Because Jesus Loves Me by Bible Society NSW; The Big Picture Story Bible by David Helm, God’s People Grow Part 5; Hairy Maclary’s Rumpus at the Vet by Lynley Dodd; My Dad by Anthony Browne; Farmer Duck by Martin Waddell & Helen Oxenbury; We’re Going on a Bear Hunt by Michael Rosen & Helen Oxenbury. The boys were spoilt with really great books this week. I would highly recommend having all the above books in your own home library and as gifts to others. The Hairy Maclary series by Lynley Dodd, My Dad by Anthony Browne , We’re Going on a Bear Hunt by Michael Rosen and Farmer Duck by Martin Waddell (both illustrated by the lovely Helen Oxenbury) are classic children’s books. God willing, I can keep these books for my grandchildren and read it with them. Because Jesus Loves Me by the Bible Society NSW will also be one of those books I intend to keep for my grandchildren. It introduces babies and children to the truth that Jesus loves them. There are simple “BodySmart” actions on each page enabling children to actively “read” with you. N and M have read this book a number of times already and they know the words and actions to the whole book. Children grow so quickly and before I know it, God willing, E will know all the lines and actions to the book too. 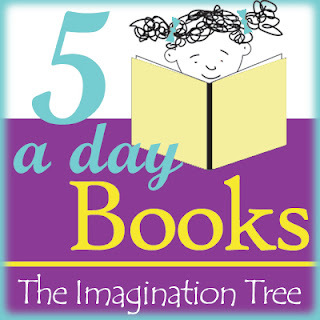 We are part of The Imagination Tree 5 a Day Books challenge.